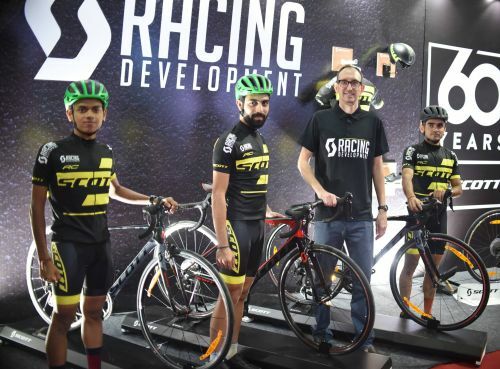 8th December, 2018: SCOTT Sports India announced the launch of SCOTT Racing Development, its first road bike team in India, as a grassroots development initiative to promote the sport in the country. Globally, the brand has an illustrious history with the sport, including supporting teams like Mitchelton-Scott, Orica Scott as well as Olympic medallist Nino Schurter. After conducting a trial that attracted over 200 participants from across the country, SCOTT Racing Development unveiled Sanresh Shedekar and Jehaan Panjuani from Mumbai along with Meerut’s Monty Choudhary as its 3 cyclists for the team in its inaugural season. The three road cyclists will be incubated to the SCOTT Racing Development training programme on a long-term basis, to participate as a team in 8-10 races in India as well as 2-3 International races. The coaching plan focuses on both physical and tactical aspects. While the physical emphasis would be on effective training as well as improvement of technique, tactical would focus on developing a race strategy and adapting to conditions. In addition, the riders will be guided on understanding performance data to help manage their training and results. “We’re looking to put in place a structure and process that is rider focused but ultimately giving the rider the tools and responsibility to deliver. I believe the team approach has a lot of advantages and our selection process also focused on building a team as opposed to finding individuals. We felt this group had the right dynamics to work as a team, with each one capable of handling physical responsibilities that maximise each rider’s opportunity to improve. It’s a performance-oriented programme and each year we will look to add to the team by conducting trials and reach out to an ever-wider group of young cyclists. Over time, our goal isn’t only to expand the team, but also to start picking younger talent. In the UK, academy training typically begins at age 14 and that allows them to continually have a pool of talented competitive riders.” added Nigel Smith. The team will provide riders with the full range of necessary equipment for an elite cyclist as well as aid them in relocation, including employment opportunities until they progress to the next step. “We believe that this program will truly allow us to be a catalyst of change at the grassroots level of the sport in the country. Our goal over the next 3-5 years is to build an elite team and expose more cyclists to this culture for it to be a viable career opportunity. Thus, launching a team was the essential step in that direction, as it also allows for building the sport commercially too. Globally, cycling is seen as an attractive sport for brands, both in terms of visibility and reaching a targeted audience. And to make elite cycling sustainable, we’ll also be focusing on that aspect by giving brands the opportunity to partner with a niche, but fast-growing sport,” said Jaymin Shah. Going ahead, Scott Sports India aims to launch similar programmes for motorsports and running with the aim of growing these niche sports and developing a larger talent pool in the country.